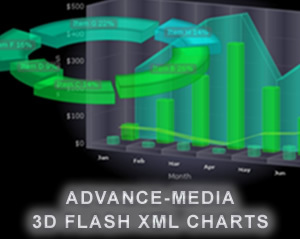 Create eye catching visual enticing animated and interactive 3D+2D FLASH (swf as1-3) chart presentations with this system, one of the most comprehensive 3D charting tools around. Combine Column Cylinder Wall Area (floating) Line (step) Bubble Surface charts colored by series and region (height) the innovative Candlestick and Kagi stock charts. Renko. Pie Doughnut Pyramid Cone Funnel staggered single series Column Cylinder (freebie as1) with slicing option. 3D Polar Radar and Rose. All generated pictures are free! Why choose 3D? Because of an excellent multi series support, no need for staggered or clustered multi series. Humans got two eyes made for three dimensional sight. 3D will ease the flow of information. This software offers a traditional 2D view option as well to satisfy all aspects and lets the user toggle between 3D and 2D while runtime. Of course any surface graph is native to 3D! - All data is retrieved via XML. This XML structure can be generated with ASP.NET, ASP, Cold Fusion, JSP, PHP or Pearl etc. to hook-up to any database for advanced dynamic real time charting or edit the XML with any text editor, no database is required. UTF-8 multilingual font support. - Boost your data analysis. Look up values of single data points. No static image. Set customizable xml attributes to suit a wide range of various homepage designs. Load external hover sound effects (.mp3) swf or image files to catch the user's attention. Full-screen save as free PNG image file and drill down links. Nest inside your own flash 6 up to 10 project or powerpoint. - Flash 9-10 AS3 supports 64-bit double-precision number format as specified by the IEEE Standard for Binary Floating-Point Arithmetic (IEEE-754). Number scaling and scientific exponential E notation. - No server sided component is needed, no strain on your server. - Small file size. Cached by the browser. A second chart displaying different data will not reload the movie resulting in a swift experience.